The conference featured H.E. Dr. Mahmoud Mohieldin, Managing Director of the World Bank, as the keynote speaker. During his speech, Dr. Mohieldin highlighted the role of Islamic finance, and the Sukuk market in particular, in directing surplus funds to productive investments by Shariah-compliant means, and stated that the World Bank had been very much part of this process through its involvement in Sukuk market transactions, provision of technical assistance to industry stakeholders, as well as contribution to the standards development process. Referring to the recent International Monetary Fund (IMF) projections, he said that the size of the Islamic finance industry could reach $1.6 trillion by end-2013. He then drew attention to the Sukuk market as an emerging tool for long-term project financing. Dr. Mohieldin noted that Sukuk departed from a conventional bond in that the former was kind of an equity instrument and limited over-leveraging by being asset-based. He then pointed to the need for the Islamic finance industry stakeholders to focus more on quality than quantity by putting more emphasis on the potential of Islamic finance for supporting the real sector activity, long-term infrastructure development efforts and, thereby, sustainable development. “It is the quality of growth that counts, not the speed,” he said. 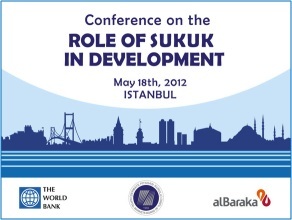 During the one-day conference, leading experts from the (IMF), the World Bank Group (WBG), the Islamic Financial Standards Board (IFSB), the International Islamic Financial Market (IIFM), government agencies as well as the financial institutions pioneering in Sukuk issuances shared their experience and exchanged their views with the audience. Conference panels addressed the key questions, including the potential benefits of Sukuk markets; the ways and means these markets contribute to growth and development in countries with Muslim population; main policy, regulatory and institutional requirements for the development of Sukuk markets; potential actions needed to unlock the potential of the market; as well as the practical issues relating to the structuring of Sukuk issuances.